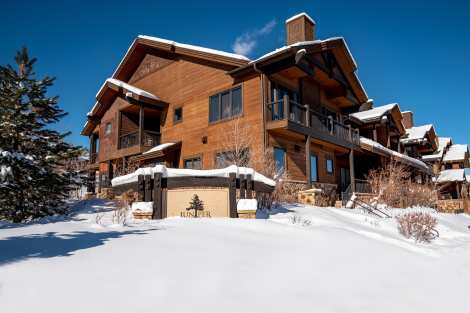 Juniper Landing is one of the most highly sought after vacation spots in all of Park City . With an ideal location for skiing, golfing, hiking and biking , this fashionable neighborhood now offers a plethora of luxury amenities , beautiful residential tree lined streets and epic mountain and ski slope views. This mountain contemporary Juniper Landing townhome offers an open space floor plan, gourmet kitchen with Viking appliances, beautiful rustic mountain timber accents throughout, and spacious luxury bedroom suites. With a king master and large en suite bath, a second king master suite spacious en suite bath and a queen suite that has both a full bed and a twin over full bunk set and en suite bath, the residence can sleep a dynamic group of guests, accommodating 10 guests comfortably. The grand living space boasts a beautiful river rock gas fireplace and comfortable western leather seating, a formal dining area and eat in kitchen seating for additional guests. The property offers a private garage, storage, and common area pool, hot tubs, fire pits and fitness. Adjacent to the new Canyons golf course and walk to the Frostwood ski gondola or to the Canyons resort plaza for shopping and dining. It was a great trip with a lot of snow! Condo was perfect. Great setup for my family...beyond my expectations...the food at Club Lespri and staff wonderful!